A New Chimney Cap May Be All You Need To Put A Stop To Your Chimney Leak! Sometimes preventing water entry and putting a stop to leaks is a simple fix. Many times, we find that the chimney is simply missing a chimney cap, or that the existing chimney cap is damaged and ineffective. In these situations, a new chimney cap will do the trick! 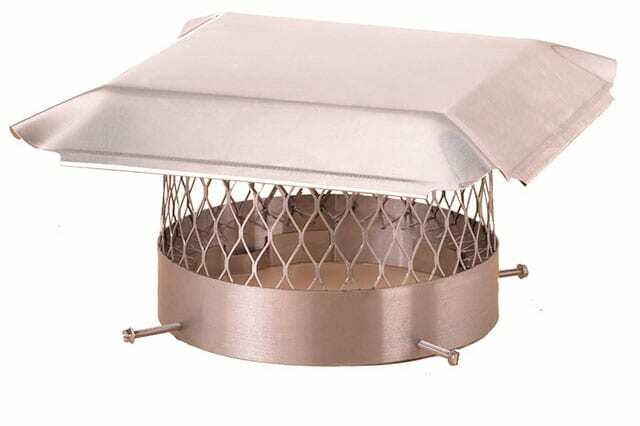 What Is A Chimney Cap & What Is It For? A chimney cap is installed at the top of the flue and prevents water, birds, and animals from getting into the chimney flue. When properly fitted, a chimney cap can work wonders! But once it comes loose – whether it’s due to strong winds and storms, animal tampering, or some other cause – the flue is wide open to the elements. This means moisture, birds, squirrels, leaves, twigs, and debris can come right into your chimney, causing blockages, damage, and odor. Because chimney caps play such a crucial role in keeping moisture out of the chimney, the cap is one of the first things we check when investigating a chimney leak. Is your chimney leaking? Have you had your chimney cap looked at? That may be the source of your leak! If your chimney cap is damaged or missing, Jiminy Chimney can help. We sell and install some of the most beautiful and effective chimney caps on the market. Our team of professionals specializes in chimney cap installation and will make sure your chimney is properly protected and that your cap is secure. Concerned about aesthetics? There are so many different styles of chimney caps available, you’ll have plenty of options to choose from! No matter what look you’re after, we’re confident you’ll find a cap that makes just the right statement for your chimney and home. We can even install a multi-flue cap! If you think you may have a chimney leak and a missing or damaged chimney cap may be to blame, give Jiminy Chimney a call at 847-893-0063. Our team can replace your chimney cap promptly and effectively. Call us or request an appointment online to have a new chimney cap installed on your chimney! Converting to a gas log set? We both sell and install top brands so you know they’ll perform well and look great, too.